I'm sure you've heard it before from other agents - high quality sales particulars, colour photographs, floor plans, websites etc., etc. and, yes we do all of that, and more. But we also have some real genuine reasons why we are a cut above the rest in Bushey. Our busy vibrant office is packed with experienced and knowledgeable staff, if you don't get in early you won't get a seat!! We have all grown up or lived in the area for a long time, we pride ourselves on our local knowledge and availability to answer your calls and queries and to assist in arranging appointments to suit you. Approachable and available. Colin and John are based in the office and are hands on - even making the tea sometimes! With over 50 years combined experience and knowledge, they have been there, done it and have the t-shirt so they can advise you on all aspects of the moving process. 7 days a week, 24 hours a day. OK we are not here all the time but even when we're closed we're working. Whatever it takes we put the extra effort in, taking messages off the answerphone in the evening and at weekends, so don't be too surprised to hear from us in the evenings or even on Sundays. We do have homes to go to and families to see, but it's our business and we put ourselves out to help you and you can usually find someone in the office from 8 am til late in the evening. Sometimes with so many agents and solicitors involved (some of who often don't seem to know what they're doing) it can be very difficult and frustrating to gain the correct information as to what is happening with your sales chain. Colin, our SuperHero, will liaise with all parties involved and report to you regularly, seeing you at home, if needed, at a convenient time to discuss everything in greater detail. ...Yes, we do want to be paid, but we offer good value for money for the service we give. We don't have a set sale fee or length of agency agreement, we are flexible, and discuss each property with you on its individual merits. ...Well we could just sit here and tell you that we are better than the rest and end it there. However, we will take a minute to point out exactly what distinguishes us from the other Bushey agents. First of all we conduct ourselves in such a manner that organisation and professionalism is key and the rest follows. We achieve this by communicating with each other and by clarifying any points and keeping records of each and everything we do. 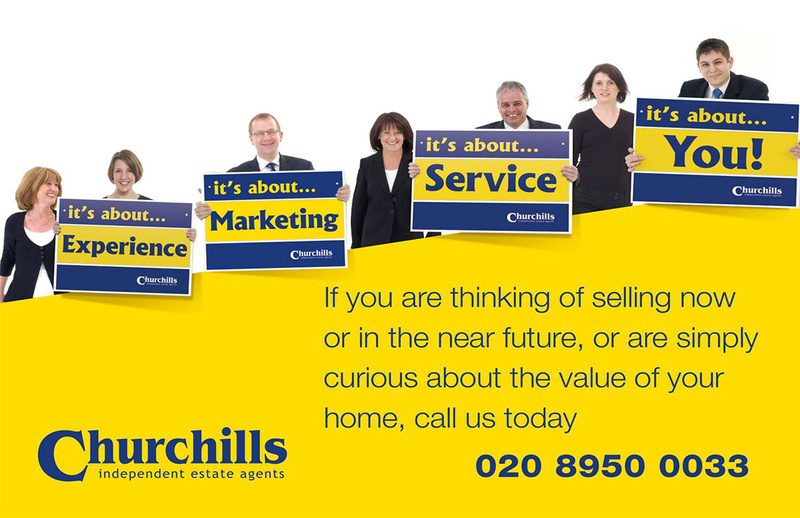 For us at Churchills our aim at the end of the day is to make sure that all applicants and vendors are happy with the service they receive and this leads to properties being sold and a large database of applicants in a position to proceed. ...Tried and tested we get results, we are young enough to be innovative, old enough to be established, no doubt in the time that you have spent in the area you have noticed our sold boards and our 20' billboard at Bushey Arches, giving you the confidence that by instructing Churchills you are dealing with agents with the necessary local knowledge and experience to sell your home.